Three times in just two months a federal judge knocked down an executive order related to immigration by President Donald Trump. This time he used Trump’s own comments against him. On Tuesday, in his ruling Judge William Orrick used a quote of Trump as support for his decision to put a block on the executive order that would have withheld funding from so-called “sanctuary cities,” which do not cooperate with U.S. federal immigration officials. Trump when announcing his executive order called it a “weapon against communities that disagree with his immigration policy,” said the Judge. The judged cited as well an interview in February in which the president had threatened to cut funding off to California calling the state out of control in many ways. His first comment was evidence the administration’s intent of the executive order was to apply broadly to various types of federal funds, and not only a relatively small amount of grant money as had been argued by the Justice Department, said the Judge. The second statement gave evidence that two governments in California that had sued to stop the order – Santa Clara County and San Francisco – thought they would be a target, said Orrick. The ruling by Orrick was another setback for immigration policy at the White House as it nears day 100 later in April. 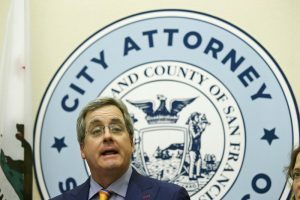 The sanctuary city executive order was amongst a flurry of measures involving immigration that Trump had signed during late January, including the banning of travelers from seven countries that are Muslim-majority and a directive that called for the building of a wall on the border between the U.S. and Mexico. The words of Trump were cited as well by federal judges in Hawaii and Maryland, who in March blocked the revised visa ban on people from six countries that are Muslim-majority. Both Judges said that comments by the president supported allegations that the visa ban had been aimed at Muslims. The preliminary injunction by Orrick against the order will remain in place during the time that the lawsuits by San Clara County and San Francisco go through the court system.